The 8-bit Map of the USA is an animated map of the United States in the style of a vintage 8-bit computer game. This pictorial map features 8-bit representations of popular tourist destinations from across the country. 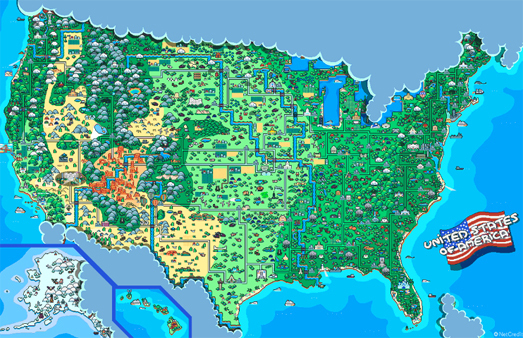 The 8-Bit Map of the USA is just an animated GIF so you can't actually zoom in on areas of the map. If you want to explore locations around the world in a little more detail (as much detail as 8-Bit allows) then you could refer to 8-Bit Cities. Back in 2010 Bret Camper released 8-Bit City - New York, an interactive 8-Bit map of New York, which resembled the maps used in 1980's computer games.